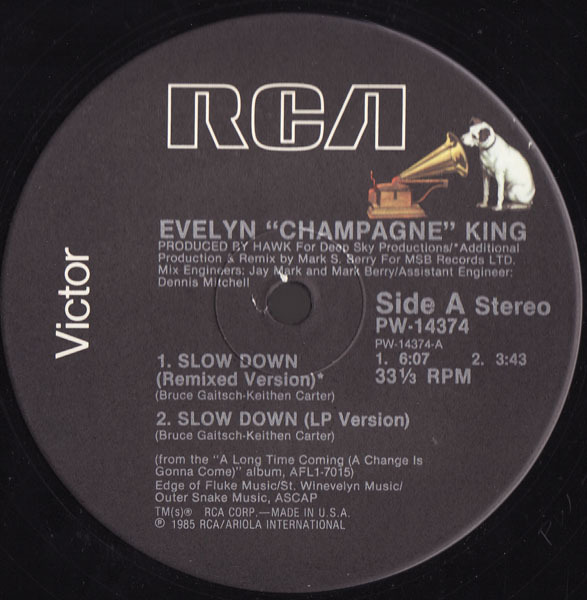 If one were asked to name the two producer/songwriters who brought Evelyn “Champagne” King her greatest commercial success along the way, the answer would be obvious: Theodore Life, a.k.a. T. Life, and Kashif. Life made the Bronx-born King a major star during the Disco Era, producing her 1977 debut Smooth Talk (which boasted the disco-soul smashes “Shame” and “I Don’t Know If It’s Right”) and serving as the main producer on her sophomore album, Music Box (a 1979 release). In the United States, Smooth Talk was certified platinum by the Recording Industry Association of America (RIAA) for sales exceeding one million copies—and the RIAA declared Music Box gold when it passed half a million in sales. But King (born July 1, 1960) sold even more records working with Kashif, the main producer on 1981’s gold I’m in Love and 1982’s double platinum Get Loose. In fact, Get Loose was King’s biggest album ever: that classic sold over two million copies in the U.S., hit #1 on Billboard’s R&B albums chart and contained the single “Love Come Down” (which was written by Kashif and soared to #1 on Billboard’s R&B singles chart). But while Smooth Talk, Music Box and 1980’s Call on Me (King’s third album) were greatly shaped by Life and I’m in Love and Get Loose were greatly shaped by Kashif, King worked with a variety of different producers on 1983’s Face to Face—and she maintained that multi-producer approach on So Romantic in 1984 and A Long Time Coming in 1985. The list of producers on A Long Time Coming (which was King’s eighth album and final album for RCA Records) includes David “Hawk” Wolinski (formerly of Chaka Khan’s band Rufus), Allen George & Fred McFarlane, René Moore & Angela Winbush (who recorded together as the male/female vocal duo René & Angela before Winbush went solo), bassist Bobby Watson (another former Rufus member) and none other than T. Life, who produced the ballad “If I Let Myself Go” and the energetic dance-funk jams “Chemistry of Love” and “If You Find the Time.” George & McFarlane, meanwhile, produced three dance-funk offerings on this album: “I’m Scared” and the singles “Your Personal Touch” (a #9 R&B hit in Billboard) and “High Horse” (which made it to #19 on Billboard’s R&B singles chart). And the exuberant “Spellbound” is a René & Angela song that they produced with Watson, who shouldn’t be confused with the Kansas-born jazz saxophonist Bobby Watson. Wolinski produced the funky, grinding “Slow Down” (which was released as a single and stalled at #81 R&B in Billboard) and a passionate remake of Sam Cooke’s 1963 soul classic “A Change Is Gonna Come,” both of which are among this album’s more rock-influenced offerings. A Long Time Coming on the whole doesn’t have as strong a pop-rock influence as So Romantic, but parts of this album do incorporate pop-rock elements—and King, in a November 2013 interview, remembered that she was pleasantly surprised when Wolinski took Cooke’s gem in a rock-influenced direction. A Long Time Coming has been reissued on CD in the past, but FunkyTownGrooves’ expanded 2013 edition is by far the most generous. Originally a nine-song LP, A Long Time Coming has been expanded to a deluxe two-CD, 24-track set—and Disc 2 is devoted exclusively to bonus material. The 15 bonus tracks on Disc 2 include edited and dance versions of “Your Personal Touch,” remixed versions of “High Horse” and four versions of “Slow Down” (two dub versions, two remixes). Despite the success of “Your Personal Touch,” A Long Time Coming stalled at #38 on Billboard’s R&B albums chart. King left RCA after A Long Time Coming, re-emerging on EMI Records in 1988 with her ninth album, Flirt (which contained two Top 10 R&B singles: “Hold On to What You’ve Got” and the title track). After 1989’s The Girl Next Door, King was dropped by EMI and resurfaced on Expansion Records (a British label) with 1995’s I’ll Keep a Light On. Her most recent album is 2007’s Open Book. Alex Henderson’s work has appeared in Billboard, Spin, Creem, The L.A. Weekly, JazzTimes, Jazziz, Salon.com, AlterNet, Cash Box, HITS, CD Review, Skin Two, Black Beat, The Pasadena Weekly, Black Radio Exclusive (BRE), Music Connection, Latin Style, The New York City Jazz Record, Jazz Inside Magazine and many other well-known publications. Henderson (alexvhenderson.com) also contributed several thousand CD reviews to The All Music Guide’s popular website and series of music reference books.